I'm gonna review the original G1 release � starting with the five Predacons, and then moving on to the gestalt, Predaking, at the end. Keep in mind I have all G1 stuff, so if the reissue is different, I'm not gonna know about it. I'll review these in the order I got them. Quote: "Those who conquer act; those who are conquered, think!" Barrels through life with an uncontrolled fury. Has trouble talking coherently for more than a few seconds before violently lashing out at anything near him, friend or foe. TV calms him... Stares at rock music videos for hours. As tiger, can leap 300 ft. in height, 500 ft. in length. A kick from his foreleg can crumble a cinder block well. As robot, carries 60,000 volt lightning rifle, 5000 degree thermo-sword. 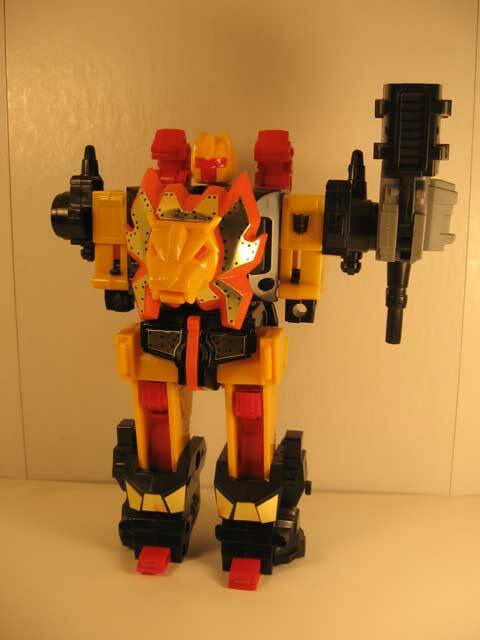 Combines wit;h fellow Predacons to form Predaking. Okay, so Rampage was the first one I found. I was 10 at the time, and had a laminated '86 catalog I had been given that I drooled over every time I looked at it. One day my parents said we were going to the Ohio Steam Threshers Festival. In my 10 year old mind, I was thrilled. Thrilled like I was told I was going to die in 2 hours. Anyway, we went, and there was a flee market. So I go picking through boxes and come across this guy, whom I didn't recognize, but he had a Decepticon emblem on him, so I bought him for 25 cents. Later I noticed he had a combiner peg-thingy on his back, and upon further inspection, I realized he was one of the Predacons. 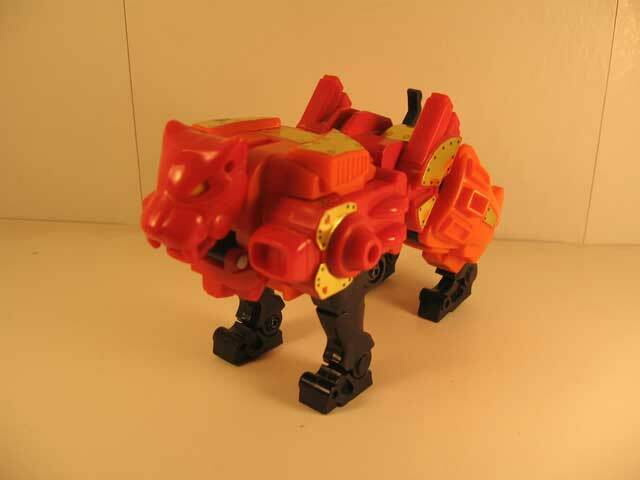 The tiger mode is primarily red and orange, with a few gold stickers and black legs and tail. The head has a full 360 degree rotation and you can open the mouth. You can attach two small pistols in the ports on his shoulders. The back legs look powerful but if you look at it from above, they're hollow. Oh well, it's still spiffy. My only quip with it is that his robot head just hangs down from under his tiger head. Unlike Razorclaw (whose face is aimed more at the ground than forwards) it's angled, so you can see both faces from the front. Still, a rather spiffy mode given the times, since the only other real creatures at the time were Gnaw and Trypticon, and the big fella doesn�t even have a robot mode. I'd describe his transformation, but I'm terrible at it, and it would probably only confuse you... Anyway, after some quick twists, turns, and tucks, you have Rampage's robot form. Again, the colors are orange and red. The only black comes from the bit of tiger feet poking out from behind his shoulders, and from the front of his legs. He has several points of articulation, including his knees, hips, and shoulders. Also, if you want to count what that tail becomes in robot mode, he has another... Anyway, he stands about two and a half times as tall as your average Seacon, Combaticon, whatever, and twice as tall as a Constructicon. In short, he's BIG. All the Predacons are roughly the same height, save Tantrum, who's about an inch or so taller than the rest. I particularly like the size contrast between the new Classics line and the G1 Predacons; Rampage standing next to Starscream gives him an air of power and dominance that wasn't there when half the other toys of the time were his height. In short, Rampage is a pretty cool toy. He's well rounded, he's big, he's chunky, and he has a sword. What more could you want? Transformation: 5 � Harder than a Scramble-City style combiner, but it's no Sixshot. Durability: 10 � He's built like a brick. The only thing I can see breaking is the tail, and that would only be after some rough play. Fun: 7 � He's cool, and the sword is pretty neat. Price: 10 � For me (25 cents! ), at least, but if you want a complete one, you�re looking at about $30! Overall: 8 � for a figure this old, he's still sweet. Quote: "Conquer the skies and below you will fall." He's like a kid at a candy store - always delighted by all the targets he has to choose from. Builds mecha-nests atop tall buildings and mountains, composed of late-model sports cars, wings of jets, theater marquees. Back-mounted rocket thrusters allow speeds of up to 300 mph, 2000 mile range. Can see a dime from 10,000 feet. Has particle-beam rifle with infra-red sight, and laser guided sword. Magnetism inhibits flying ability. Combines with fellow Predacons to form Predaking. I think I was 12 when I found him for (don't kill me) 60 cents in a thrift store. He didn't have wings, but for 60 cents?! Hell yeah I was gonna buy it. 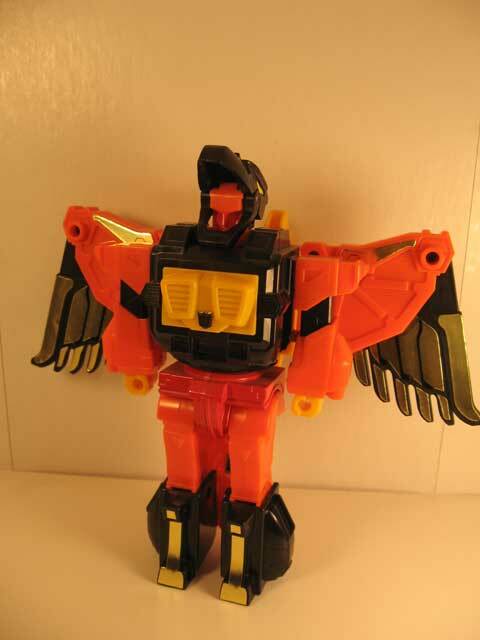 I recently picked up a second Divebomb with the wings so I could complete Predaking, and he ran me about $20. Anyway, enough of my sad history, here's Divebomb. 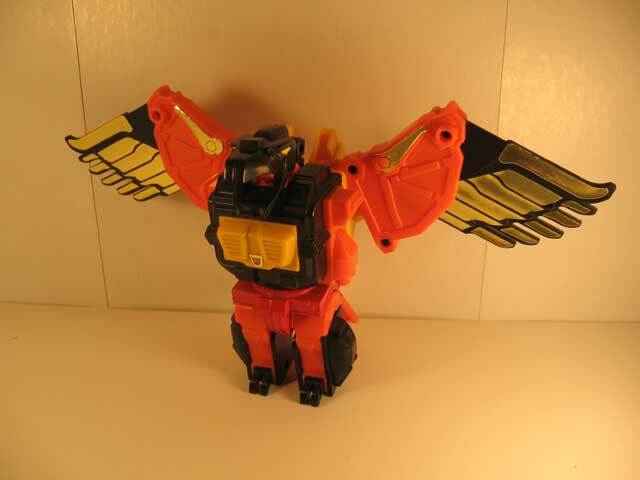 Divebomb is primarily red and orange with a dash of yellow, and some flashy gold from the stickers on his wings. Also of notable mention is that his beak can open. This way, he can squawk at the Autobot losers he's about to attack. He's the biggest bird of his time, completely dwarfing Laserbeak or Buzzsaw, and could swallow Swoop. I think he's about the same size as Doubledealer's bird mode, but I've only seen one of those, and I didn't get a very good look at it. Anyway, again, it's a nice alt mode, but the one gripe I have is that the wings are on his back rather than his sides. Having had a wingless one for years before I got one with wings, I tend to always look at the wings like plane-type wings rather than bird wings, since his robot arms are where his wings should be... I dunno, it's odd, but the wings ARE a bit far back. Still cool, though. Some flips and turns, and you have Divebomb's robot mode. The bird wings are utilized again in this mode, but they are folded a little bit to give him what is in my opinion a more powerful looking robot mode. Again, like Rampage, he is nice and chunky, and has an air of power about him. 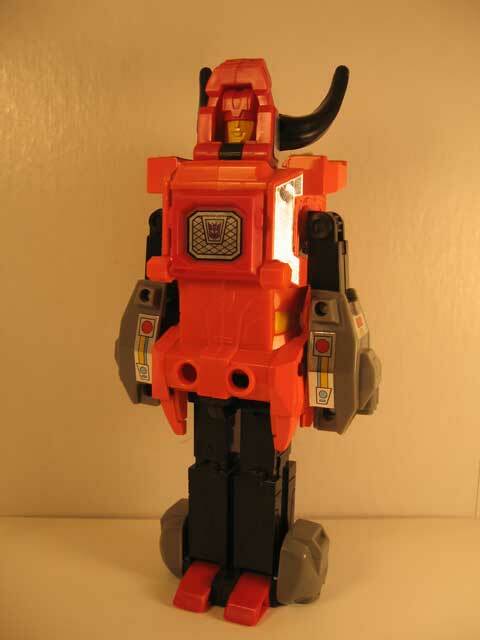 Of course, he is still red, orange, and black, with a bright splash of yellow for his chest plate. I like how the beak can be made to look like a helmet on his robot head, but I always have trouble getting it to stay put, so I usually just flip it up and make him a conehead. Like all the other Predacons, he has a sword, plus two guns that can be attached in either mode. Divebomb probably has the most playability because he's a bird. He can fly, he has guns in either mode, his beak opens... The possibilities are just endless. Transformation: 4 � Not as hard as Rampage's. Probably the simplest of the five, actually. Fun: 8 � Again, even though he lacks a gimmick, he's fun because of his size. Just making him float above Powerglide is sweet. Durability: 8 � The robot itself is sturdy as a cinder block, but the wings are a little fragile. Price: 10 � Again, 60 cents? Umm, yeah? $30 on eBay, though. Overall: 9 � The nice thing about all the Predacons is that any of them is a good toy by itself, where some gestalt teams (*cough* Protectobots *cough*) were made just for the combination gimmick. Divebomb is bigger than Silverbolt and more than half of Superion's size. Quote: "The best advice is not to listen to advice." Doesn't listen to anyone, particularly his friends. Smug, arrogant. Puts up a stubborn front to hide deep-rooted insecurities. More vulnerable to psychological than physical attacks. In rhinoceros mode, his horn can puncture 3-foot thick steel, release corrosive acid. Uses plasma-sphere shooter that emits explosive energy balls; has light distorting diffraction sword. Combines with fellow Predacons to form Predaking. 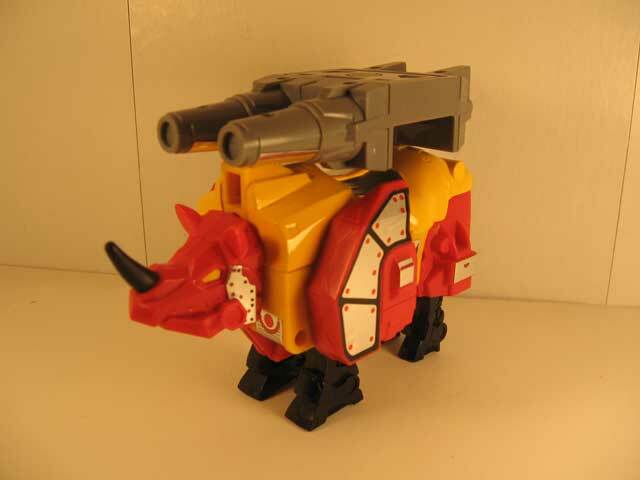 The Rhino mode is yellow and red. Not a shred of orange on this fella. Also, if you attach his mortar launcher, he picks up some grey. He has black legs, and his horn is black as well. The only articulation is the head, but that' okay, since you can put some smaller figure (Bumblebee?) on his horn like he's getting tossed. The face is particularly well sculpted, making it look like he's sneering at whatever he's about to charge. He even looks like he's grinning � enjoying it! Pull out the legs, flip the red thingies, flip his rhino legs back into his robot legs, push in the forelegs, pull out the arms and flip up the head, and the robot mode is there. Headstrong is the shortest of the Predacons, but his robot mode looks cool. Again, yellow red and black, but the way it's dispersed is pretty cool. The rhino's forelegs become red blocks on his chest, breaking up the offensive yellow and giving him a more powerful looking appearance. The only articulation he has, though, are his arms, which takes away from his posablilty a wee bit. I prefer him in rhino mode. Headstrong's rhino mode is wonderful. Look at the other G1 Rhino (that being Ramhorn) and you'll see which is obviously the cooler dude. Robot mode suffers from lack of posabilty, and the legs make him look like he's standing at attention all the time. Transformation: 5 � The hardest part is getting rid of the rhino legs. Fun: 7 � 5 because of the rhino mode, 2 for the robot mode. It's just missing out because of the lack of posability. Price: Same as the others. Quote: "Anger gets me running better than any other fuel." Prefers brute force over reason. Steam comes from his nasal ducts when he is enraged. Smashes head-first into highway trestles and small buildings to relieve his aggression. Always feels better afterwards. Carries 4 exterior fuel tanks, capacity 1600 gallons, as a reserve for himself and his comrades. His horns shoot bolts of 20,000 volt electricity. Carries a catalytic carbine that shoots destructive chemicals, and an electro-sword. 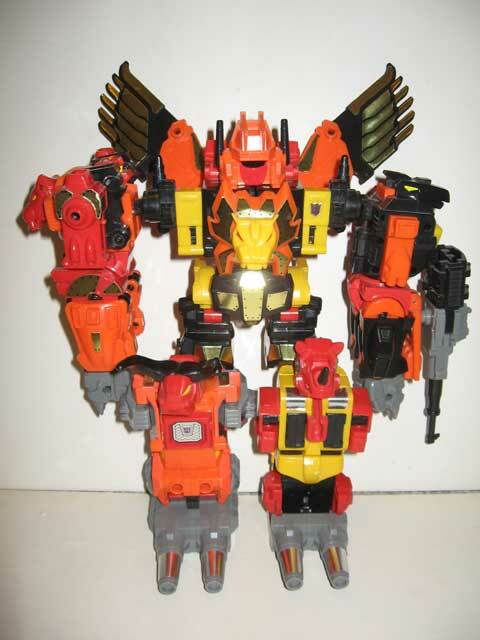 Combines with fellow Predacons to create Predaking. BOOOOOOOOOOO � I really don't like him. 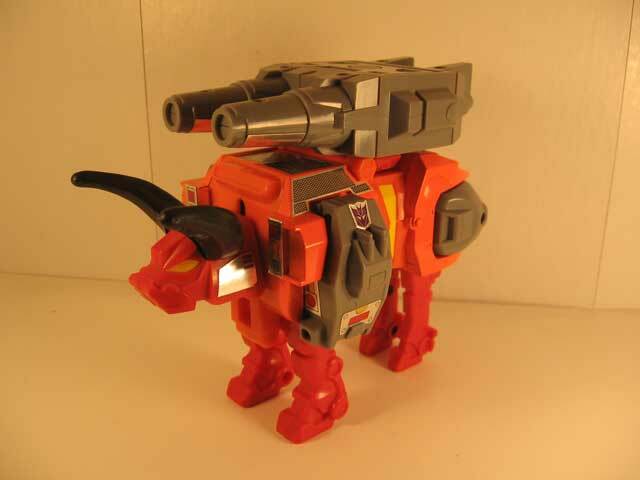 Even with his mortar launcher on his back in animal mode, he doesn�t look all that threatening. If he had the details that make Headstrong look menacing, I may like him more, but as he is... Not my first choice for a Predacon. Transformation: 4 � A four year old could figure this out. 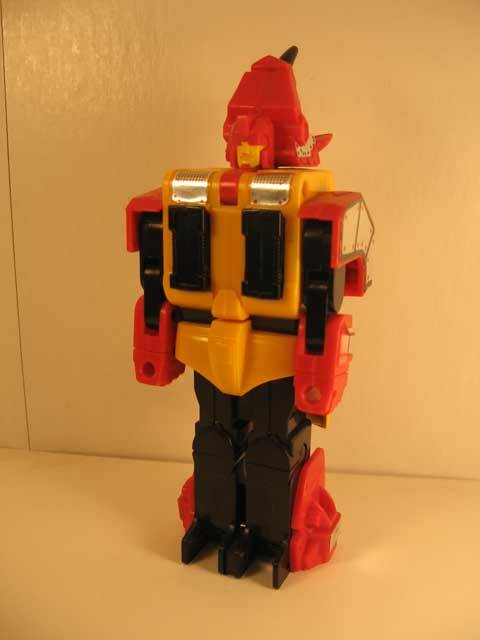 Overall: 4 � Get the rest first, then buy this so Predaking has two legs. If he didn't look good as a leg, I'd say just buy two Headstrongs instead, but I have to admit, he does look cool as a leg. Quote: "All good things succumb to those who wait." All business. Hates waste in any form...won't burn an extra drop of fuel unless he's certain the results will be worth the effort. Long stretches of inactivity often mistaken for laziness. Explodes into furious, ferocious action when it's time to strike. As lion, can leap distances as long as a football field. Claws can rip through foot-thick steel. Has twin concussion blasters and sonic sword. Combines with fellow Predacons to form Predaking. And finally, the leader of the Predacons (and the only real Predacon leader there will ever be, Hasbro). I very recently picked him up on eBay, and got Predaking's head in a separate auction, so they're the newest in my family and thus, I'm sort of biased toward my new toy. Razorclaw is the leader of the Predacons, and as such, has a load of extra little features that his cousin-in-molding, Rampage, does not. These include the launchers on his shoulders and the spot for the cannon on his back. On the other hand, he has no ports for rifles. The lion mode is red, orange, yellow, and black. A good mix of all the Predacon colors. 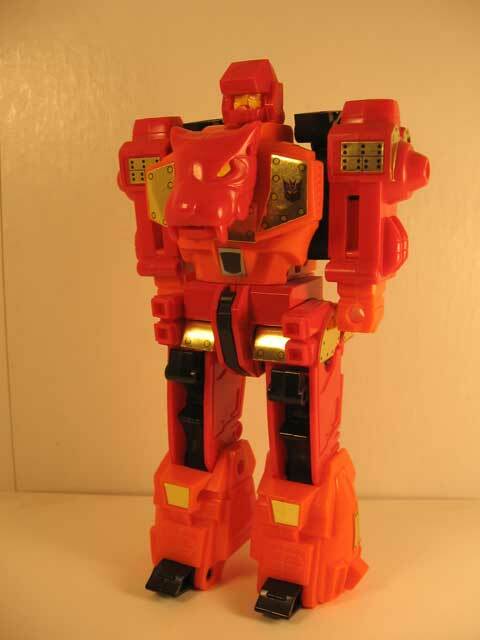 The mane around his neck gives him an air of authority and power that the other Predacons lack. He also has a pair of cannons on his shoulders. Instead of mounting guns on his shoulders like Rampage, he has Predaking's cannon on his back. In this case, it's a double-barreled cannon-o-death. This thing is BIG, I might add � fitting for the leader of the Predacons. In all, it's much the same as Rampage's mold, but his more fiery color scheme and the mane just make him look much more powerful and commanding than his comrades. Again, like Rampage, but with different colors, and, again, he can mount that big cannon on either shoulder. Unlike all the other Predacons, he comes with no pistols, but does have the spiffiest sword of the lot of them. Sadly, none of the Predacons came with a massive sword for Predaking, but it's okay, we love him anyway. 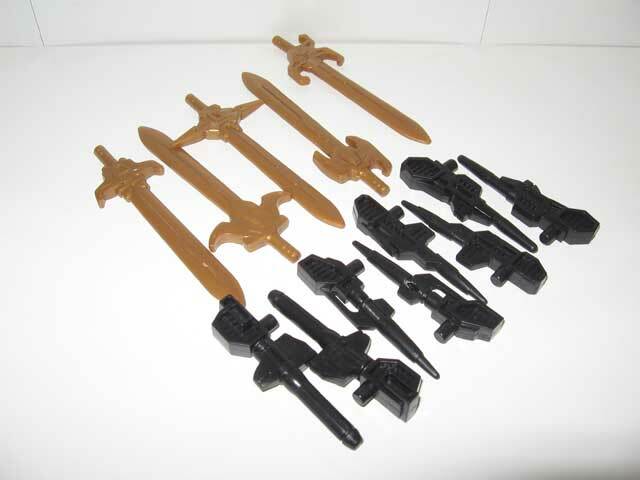 Still, just look at how the titanium one got that HUGE beatstick, and G1 gets a dagger... Oh well, I'm getting ahead of myself. Transformation: 5 � It's basically the same as Rampage. 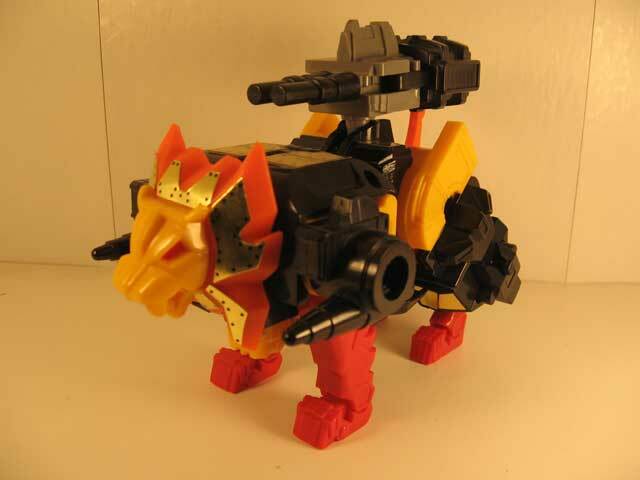 Fun: 8 � The lion head really stands out on him, and the two-mode cannon adds a lot of fun, too. Durability: 9 � The clips that hold Predaking's legs on are prone to snapping, but otherwise very durable. Overall: 8 � Definitely my favorite of the Predacons. You can stick bits and pieces of other Predacons on there too, like Divebomb's wings or any of the pistols and swords. Quote:"Destroy first; ask questions later." The closest thing to the perfect fighting machine the Decepticons have. As a warrior he has no equal; as a weapon he has no restraints. His actions result from seemingly savage, animal instinct. Can lift 500 tons; reacts to any movement he sees within .002 seconds. Can generate protective electric field. Wields powerful X-ray laser cannon. Each foot houses twin mortar shell launchers. No known weaknesses. He's absolutely massive. He stands a head taller than most combiners, with only Superion really giving him any competition. Devastator, Defensor, Menasor, etc. are all dwarfed. I don't have Abominus, but he is bigger than Computron as well. This owes to the fact that the Predacons were all bigger than a standard Scramble-City style combiner. Predaking is huge. Rampage and Divebomb form the arms, Headstrong and Tantrum the legs, and Razorclaw the body. Divebomb's wings attach to Razorclaw's back, giving him flight. The hands have four spikes on each of them, giving him fighting claws. The feet have two mortar launchers each. As if he needed anymore fighting power, Razorclaw's cannon reverses into a massive single barreled cannon that attaches to Divebomb's tail so that it can be used. If you really want, you can attach two guns to his wings to give him the cannons he had in the show, but I prefer using Hot Spot's two flamethrowers for this. It's more on scale with the rest of Predaking. All of the animal heads are showing in this mode, giving him sort of a primal feel. In short, he's about the most powerful Decepticon you can picture. His massive size, bulk, armament, and terror-inducing wonderfulness is all part of the package. I mean come on, just his head is nearly the size of bumblebee. What more could you want?! Transformation: 6 � Transform them all to animals, flip a bit, insert some hands and feet, pop on that helmet, and you have Predaking. Arm him as you see fit. Fun: 10 � He's Predaking. He's the biggest combiner out there. Put him next to some Classics and it looks like the show. Overall: 10 � If you don't buy ANY other combiners, buy this one. He is truly a superb example of the G1 universe.